தூய்மையான, வேதமுடிவான பேரின்பம் தரும் அன்பனே, மாலை சூடுபவனும், பாதுகாப்பு தருபவனும், வலிமையான பிரமன், திருமால், தேவர்கள் யாவரினதும் கடவுளும் ஆன; எனக்குள் இருக்கும் ஆணவம் போகுமாறு ஞானமும் புகழும் தந்த பெரிய கடவுளே முருகா வா. Very happy to note that you have brought this inscription on the Vel at Maviddapuram temple. Present day society never bother to read this. They just ignore. May be because the picture of Vel with the inscription is just hung on a pillar on a side so that people may not be bothered to go near and read and further ther is no explanation given below. 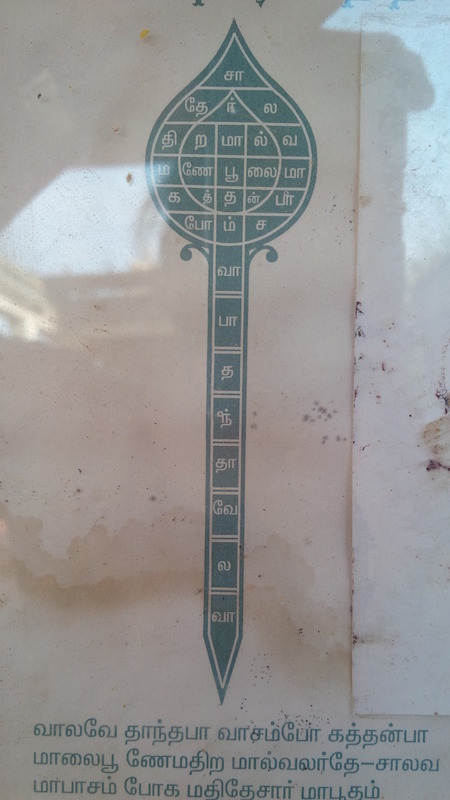 It would be better if the Kurukkal can organize it in such a way the spiritual aspirants could read and understand.There was another picture of peacock too with the inscription. I will try to get that too for you. Thank you. Is it the same inscription on the picture of the peacock?